Kentucky Senator Rand Paul is leading the pack in the GOP 2016 race in Iowa, a recent poll by the Public Policy Polling Institute (PPP) finds. Paul, with 18% of registered Iowa Republicans saying they would like to see him as the GOP nominee, commands a large lead over two possible Florida contenders, former Florida Governor Jeb Bush (11%) and Florida U.S. Senator Marco Rubio (10%). New Jersey Governor Chris Christie placed second at 16% followed by former Vice-Presidential candidate Paul Ryan with 15%. 41-year-old Rubio's popularity amongst conservatives appears to be falling since the CPAC straw poll that placed him at 23% to 50-year-old Paul's 25% back in March. 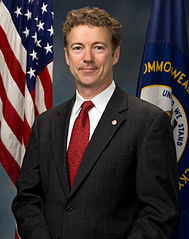 The recent PPP poll found that Paul is leading based on his appeal to the furthest right segment of the GOP. Voters who describe themselves as 'very conservative' favor Paul at 25% with no one else polling above 13%. Christie is the favorite among moderates with 34% followed by Bush at 21%. Despite his relatively young age as a Presidential candidate, Rubio is having difficulty with younger Iowa Republicans, garnering only 3% support from those aged 18-45, while Paul leads the younger vote at 32% followed by Ryan at 26%. Bush is the favorite amongst seniors 65 and older with 20%, followed by Rubio with 15%.